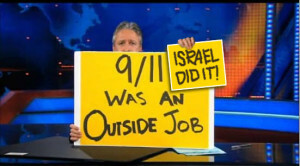 For the last 16 years, anyone who dared to question the official 9/11 story blaming Muslims for the terrorist attacks, is immediately declared a Jew-hater, Holocaust denier and conspiracy theorist by the organized Jewry despite the fact Israeli prime minister Benjamin Netanyahu described in detail what happened on September 11, 2001 in his 1987 book, Fighting Terrorism: How democracies can defeat Domestic and International Terrorism. On September 7, 2006, B’nai B’rith’s ADL chief Abraham Foxman in a statement said that blaming Jews for committing 9/11 is old-fashioned anti-Semitism. But in March 2015, when the leader of US-based Nation of Islam agreed Louis Farrakhan agreed with Barry Chamish (listen below), Abraham Foxman called him a Jew-hater, Holocaust denier and a nutcase. “OK, but what’s the evidence that Israel was behind 9/11? By far the best summary I’ve seen is the WikiSpooks post 9-11/Israel Did It. (Incidentally, as many of my regular readers know, I’m half-Jewish on my father’s side, so knee-jerk charges against me of “anti-Semitism” can be stuffed in the appropriate place),” says Perloff. Your comments appeared in the past many times on The Occidental Observer and Counter Currents, sites I used to follow regularly. I still check in every once in a while, but I’m much more of an idenpendent thinker these days. That is to say, I spend more time contemplating my own ideas w/regards to that subject matter. Right now, there appears to be a disturbing trend developing w/in the ranks of the “AltRight”. These outlets are increasingly parroting the talking points of the CounterJihad movement. It’s bad enough that disinformation coming from CounterJihad is highly misleading, even if some material is factually correct. Moreover, adopting counterjihad positions will derail the “altRight” w/respect to its original, organic vision and likely channel it into serving Zionist interests in one way or another. This being said, I have a “countersignaling project” in mind aimed at stemming this dangerous tide. I’ve got a lot of content to work with, but it can use some finetuning. Thus, I humbly request your assistance in this and will be grateful if you can reapond to some questions of mine. If you are willing, do you have an email you regularly check? *****It will be understandable if you decline—the “AltRight”, after all, is a movement centering on Euro Identity. The problem is that too many folks make it one of negative identity & fail to see a bigger context, myopically centrating on certain things(e.g. economics and geopolitics are often ignored). Now, I too believe in maintaining strong civilizational identities. Yet, I see no reason why the Frank and the Turk, so to speak, can’t collab on certain things when the benefits are mutual. I was banned at the ‘The Occidental Observer’ several year ago for posting alternative opinion on Islam, Muslims and Jews. However, I never left comment on ‘Counter Currents’. Alt-Right is a pro-Israel Zionist Jewish project. Its so-called ‘Euro Identity’ agenda is to fuel hatred of Muslims among the White Christians for the benefit the Zionist entity. It’s Jewish Talmud who curses Jesus and his mother Mary – and Holy Qur’an. The ‘antisemitism’ was created by Jews in the West to enslave White Christians. Since 9/11 they’re repeating that trick against Muslims. If you wish, you may leave your questions at ABOUT on this website. I will try my best to answer them. Wow, that’s really a shame that you were banned. Must have been ~3 yrs ago, when I last remember your comments there. You can always post under different aliases, you know, and tweak the writing style ever so slightly. The message is worth it. Just to be clear, there is a difference between the AltLite and the AltRight proper. The former are civic nationalists and OPENLY shill for Israel despite taking on more libertarian positions toeards intervention. Cernovich is a classic example. Gav McInnes, Molyneux and Milo also. Gav works for Rebel Media run by Ezra Levant. Milo for Breitbart. Get the picture? On the contrary, the latter are ethno-nationalists with relatively pure intentions—–at least many are. They openly disavow Israel and pro-Israeli agenda—-well, when/if they recognize it. lol They have by now completely distanced themselves from the former. Richard Spencer is the spokesman and he did much of the distancing. It was refreshing to see him countersignal the anti-Sharia rally led by a Zionist think tank, just as it was refreshing to see him countersignal Pam Geller. He was just as vocal about Trump, even to the point of promoting Tulsi. lol He didn’t give Trump the “72D chess” benefit of the doubt after the airstrikes like the Trumptard pack. But then I see he retweeted Tommy Robinson a week ago….wtf(facepalm!!!). This blunder aside, I haven’t seen others do any comparable healthy countersignaling so a modest pat on the back for him. I can tell you from my engagements they are often extremely naive and misinformed on many issues despite pure intentions. That goes for the groundtroops and high command alike. Spencer, in his Tommy tweet, is no exception, I’m afraid, his brilliant moments notwithstanding. Sadder yet, many are so incredibly fixated on certain issues(Muslims, blacks…) that they are vulnerable to being suckered to Zionist ends—-despite hating Israel/Zionists and left-wing Jewish academics with a passion. Ironic. Metaphorically speaking, Nick Griffin>Tommy, but the Nick Griffin approach is still far from healthy in the long-term. Just that it makes it harder for determined right-wing Zionists to steer things in their direction. Having said all of this, I’ve met some incredibly brilliant 3RD position folks from south Brazil online who don’t fall for Zio crap so easily. Alright, I will post them there, then. @Rational Observer: I found your comments very interesting. I have mixed feelings about the Alt Right. I like the Anti zionist anti Israel stance of Alt Right, and I also understand that everyone has the right to fight for thier people including whites. In any case I found your and Rehmats comments interesting. Alt Right movement is interesting to say the least. My brother, it doesn’t seem that Perloff is a Nobel laurate.